Honey is not just a sweetener such as sugar, it is much more. 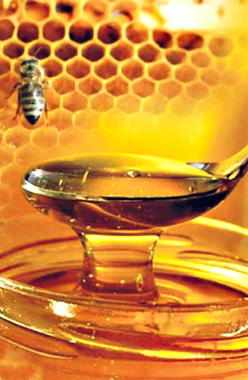 Honey is a unique product, rich in nutrients, aromas and flavors. The differences between honey of flowers and honey of conifers are significant. Honey, bee pollen, the residues of conifers are rich in minerals. The honey from the nectar of flowers is easily and rapidly crystallized, while forest honey is darker and slowly crystallized. According to the EU legislation (Directive 2001/110 / EC), honey is, "the natural sweet substance produced by bees of the species Apis mellifera bees nectar of plants or from secretions of living parts of plants or on the living parts of plants secretions of record of plant-sucking insects, transform by combining with specific substances of their own, deposit, dehydrate and store it in the honeycomb of the beehive and mature." We would like to express this a little bit more understandable: Honey is a natural product with a sweet taste in the nectar that the bees have collected from the flowers. Nectar is an aqueous solution of various sugars, which turn the bees by physical treatment in a kind of sweetener: the honey. The bees produce honey and nectar from flowers and collect the honeydew of the plant parts and secretions of insects that live on them. The types of honey are of great variety and are determined by the plants and trees, of which have collected the nectar or honeydew bees. Within all those differents sorts of honey, you will find some differences in the chemical composition. Thus, the blossom honeys have a higher proportion of glucose and fructose (more than 65%), while the honey of conifers a smaller proportion (around 38-65%).